A spy action comedy film, directed by Matthew Vaughn, and based on the comic book The Secret Service has all the magnificence of a Bond adventure to Sherlock Holmes astute logical reasoning of crime investigation and even follows the Quentin Tarantino’s aestheticization of violence, but entirely the movie has one significance value of black comedy with humorously enacted scenes. Story in nutshell is like Kingsman a secret spy organization being a non-governmental agency works in disguise for betterments of society in general. 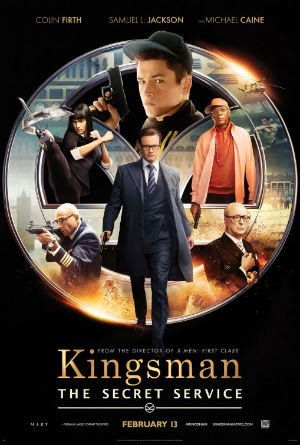 The opening has some great action drama choreographed with chic timings and appealing visuals shows one of the core members of Kingsman is killed by Harry Hart, a.k.a. "Galahad [Colin Firth] thus in return to succor his family he offers a job to the latter’s son Gary "Eggsy" [Taron Egerton] to work as a secret spy in the organization. A team of elite squad is trained under by Merlin [Mark Strong] a senior Kingsman and Arthur [Michael Caine] the Kingsmen's chief, ultimately they have to prevent a mass execution of human population by a billionaire Valentine [Samuel L. Jackson], who explains his reason of human population being akin to a virus and global warming is the Earth's equivalent of a fever, and Valentine intends to do something about the problem before the virus kills the host. A bundle of people world over brawl to kill each other as the microchip reacts which as a simcard creating havoc in the network is provided free by Valentine. A superlative climax follows which can dwarf any Bond mega endings is high in production value and edge of the seat entertainer. Worth skipping one of the crickets matches for this stylish action flick.